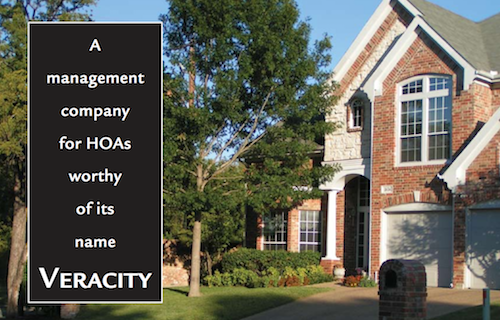 "Veracity proves their worth every day with their concern for our property. We want safety, security, honesty, and fiduciary direction ... we have a hell of a team." Available as a stand-alone service for HOAs anywhere in the U.S. or included in a multi-service scope of work. Board member online view access of invoices. Prepare and send monthly financial statements and reports to the Board. Bank lockbox service ensures accurate, timely deposits with options for recurring payments and credit cards. Aggressively collect delinquent dues, including contingency options with guaranteed results. Maintain accounting records and HOA documents. Assist the Board in preparation of the annual budget and arrange preparation of tax returns and annual audit by an independent CPA. Send association notices and HOA newsletters to residents. Board members are given online access to HOA bank accounts, so they always know how HOA funds are being spent. Obtain Reserve Study to ensure appropriate long-term funding. Provide 24 hour emergency service, 7 days a week. 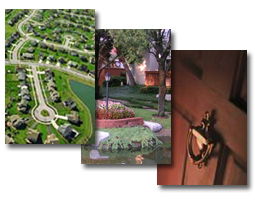 Maintain HOA records and stay apprised of new regulations and laws. Make regular diligent property visits for repairs and violations. Attend Board meetings and annual members meetings. Obtain bids for maintenance and capital improvements and oversee their completion. Develop short-term and long-term strategic plans to eliminate waste, ensure preventive maintenance, and increase property value. Provide responsive customer service that promptly replies to homeowner repairs. Specialized experience in maintenance and capital improvement areas crucial to a successful association. Offer innovative financial solutions for completion of large-scale renovations. Oversight of maintenance and competitive bidding process. Help Board with HOA rules and policies and administer rules uniformly. Increased cash and decreased delinquencies. Satisfied residents and board members who know their voices are heard and acted on. Trust in management company and vendors. Association assets protected with liability and dishonesty insurance. Assist Board members in understanding their duties as President, VP, Secretary and Treasurer and help them perform their duties in an effective manner, as well as offering independent, objective advice. Solutions for self-managed communities are available on an as needed basis. Our unique and flexible package of services will benefit your community while it stays self-managed. Help board members realize the full potential of their property, maximize the value of their investment and make good decisions. Put the interests of the board and association first by providing prompt, responsive customer service and professional assistance in management and financial matters. Adhere to the highest ethical principles in all transactions and provide full disclosure. Customize services that meet your needs, including programs for self-managed communities desiring only financial services. Keep all vendor relationships above board and refuse remuneration or kickbacks from association vendors. Live up to our name at all times. Very detailed and by the book, which is what we needed; knew more than what we knew regarding our HOA.